Becoming an Oblate of the Anglican Sisterhood of St. John the Divine has brought me many gifts. Perhaps one of the ones I value most is being introduced to Benedictine spirituality. As I first discerned my way to becoming an Oblate I asked a fellow Oblate what I could read as I began to form my own Rule of Life She suggested the Rule of Benedict and as a companion to it Joan Chittisters’s The Rule of Benedict: Insights for the Ages. I found it to be the most encouraging book I had read in a long time. I admire Benedict’s willingness to respect his fellow monks’ humanity and their need for the necessities of life, food, shelter, adequate sleep – not to indulge them in comfort, but to realise that these things were needed so they could live productive lives; his deep concern for those who slip from following the Rule and his willingness to give the monks opportunity, with support, to change their ways and turn around, at the same time removing them from community activities so that the community would not be harmed by their actions; his whole understanding of what makes community work. I loved his injunction against “murmuring.” How often do we disrupt community by gossip and discussion in the parking lot instead of in the meeting? Yet Benedict was not indulgent. He demanded obedience to the underlying values of worship, reading, work, hospitality, care for the tools, care for each other in times of difficulty and above all openness to listening to God through Scripture and to each other, from the newest, youngest, recruit to the oldest in experience. He was adamant in enforcing these values and not at all reluctant to remove those who could not, or would not comply. His Rule is not an authoritarian document, not a set of Injunctions to be enforced but rather suggestions, as he says himself, that work to bring about the ushering in of the Kingdom of God into the world. Benedict was a pioneer in a world where spirituality had got bogged down in asceticism, where the power struggles of the political world made life a frightening struggle for many people. 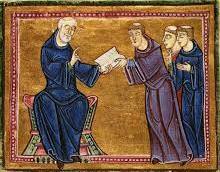 For me Benedictine spirituality is as relevant today as it was so long ago when he wrote his Rule. I have recently been r eading another of Joan Chittister’s books, Wisdom Distilled form the Daily, in which she again talks about the relevance of the Rule. We need Benedict’s wisdom in today’s world more than ever and I am deeply grateful to be reminded of it. Thanks for sharing your experience. I treasure Wisdom Distilled from the Daily, also, and revisit it again and again. Blessings as you journey as an Oblate of SSJD.